We understand you can't afford to overpay for crop insurance but you still need the right coverage for your crops. Contact us today about crop insurance and we'll get you covered. The two general categories of crop insurance are called crop-yield insurance and crop-revenue insurance. Crop Yield Insurance includes Crop-hail insurance and Multi-peril crop insurance. Crop-hail insurance is generally available from private insurers (in countries with private sectors) because hail is a narrow peril that occurs in a limited place and its accumulated losses tend not to overwhelm the capital reserves of private insurers. Multi-peril crop insurance (MPCI): Coverage in this type of insurance is not limited to just one risk. Usually multi-peril crop insurance offers hail, excessive rain and drought in a combined package. Sometimes, additional risks such as insect or bacteria-related diseases are also offered. The problem with the multi-peril crop insurance is the possibility of a large scale event. Crop-yield times the crop price gives the crop-revenues. Based on farmer's revenues, crop-revenue insurance is based on deviation from the mean revenue. RMA uses the futures prices on harvest-times listed in the commodity exchange markets, to determined the prices. Combining the future price with farmer's average production gives the estimated revenue of the farmer. 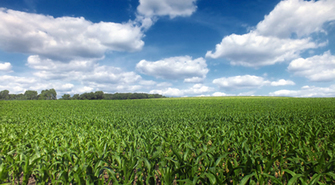 Accessing the futures market offers enables revenue protection even before the crop planted. There is a single guarantee for a certain number of dollars.